Nudge week 3 and....Other Interesting Tid Bits!! long time from All of you!! Taking care of my Mom has been on the top of the list. My Mom lives with me and my hubby and she is 90yrs. etc. So glad we have her!! loved to make things and paint furniture as well!! I bought a lovely book case with the fold down glass doors for each shelf. I will put some pictures up on my next post. 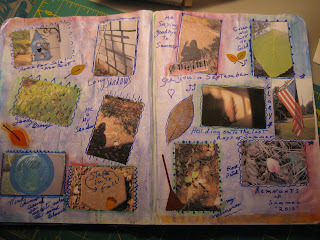 For your viewing pleasure today is a journal layout I did for the Creative Revolutionaries group I belong to. We had to take some random pictures and then put them into a journal and play! !